Spring is in the air finally and one of our most popular dessert specials EVER is on the menu. Strawberry season is upon too, so why not get this weekend started with a cake that our customers LOVE!! I have the benefit of using the most AMAZING FRESH Strawberries grown by one of our local farms in the area. This family owned farm has been in operation for 3 generations now, and we are truly blessed to have them as customers and more importantly as friends too! 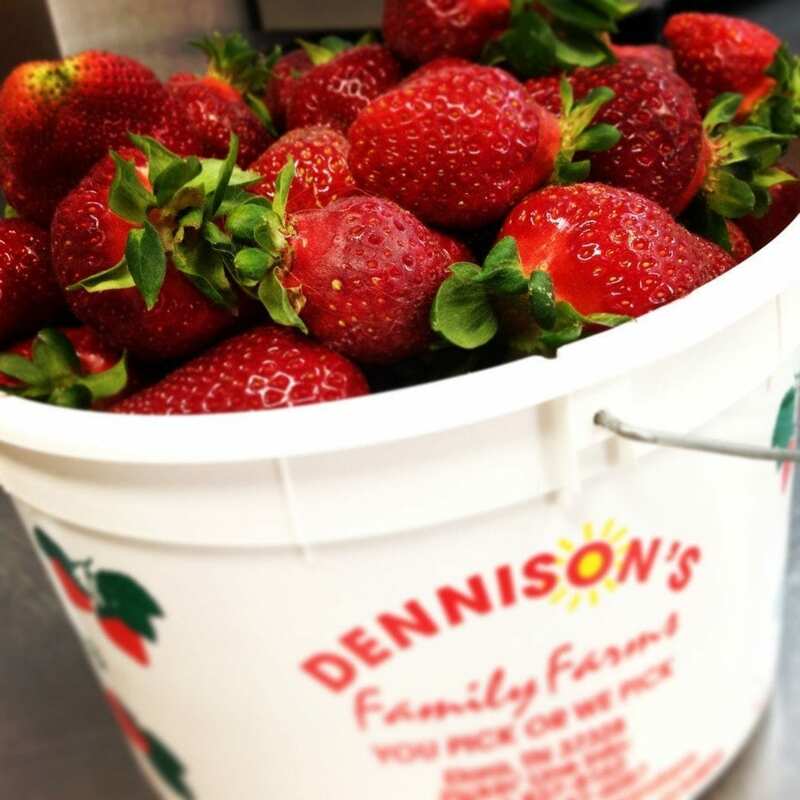 Check out my Dennison Family Farm blog post where I shared about the first strawberries being picked and a recent Giveaway we held. Stay tuned for more, cause there are plenty where those came from! The Strawberry Cake and our Elvis Presley Cake are our two most requested cake specials when I put out feelers for suggestions from our customers. It's real easy to see why, cause it's really that good! We are grateful that you guys love our desserts so much and show your support every week by sharing our weekly cake special photos to help us spread the word. Before we jump into the recipe, I wanted to be sure you know about our Weekly Cake Giveaway! Steps are simple – ENTER HERE – Like the Weekly Post on our Fanpage as well as post a comment about why you love this cake so much or maybe you haven't tried it but are looking forward to it – and then to help us spread the word – please click SHARE. We are truly grateful for your support and good luck on wining! Each week is a new contest, so enter weekly! So, for a little back story on this cake, I turn to my previous post about the Elvis Presley Cake. This recipe was also found originally on my good friend Christy Jordan's site SouthernPlate.com. I have ALWAYS loved Strawberries, as well as my two older nieces here in town, so when I went on the hunt for something Strawberry to make, I found the original recipe on Christy's site and decided to give it a try. Over the past now almost 2 years that I've been making this cake, we've fine tuned the recipe to our liking for the restaurant and quick serve, and that is what I'm going to share with you today. Checkout below my number one tool we use in our restaurant daily while preparing desserts, our mac n' cheese sauce, and even our buttermilk cornbread muffin mix. I'm sharing with you linked images over to Amazon so you can check it out in case you are interested in picking one up. I have separate devices in the restaurant that are a little more heavy duty than these, but this is just PERFECT for your home kitchen. I'll share with you below as I explain this recipe how I use the emulsifier and the processor the most. If you don't own an emulsifier, you're gonna wonder how you made it this long without one! LOL!! Working up a recipe to help with quick production is a lot of fun really. When you prepare recipes at home, you don't necessarily think about all the steps you take to prepare them but when working in a restaurant, all the extra steps you take add up to time and time is money. As we've operated our establishment now for almost 6 years, we've really taken pride in improving the processes, streamlining production of our yummy treats, and maintaining top notch quality and customer service along the way. We sure hope it shows in the food we prepare for your families every week, whether it be for you to dine in and eat with us, pickup and take home for your family to enjoy, or for a special catering event we help you with. We definitely strive to do our absolute best every week! In preparing to make the Strawberry Cake, you'll want to gather your fresh berries, cut the tops off, wash them good, and then quarter them into a bowl. 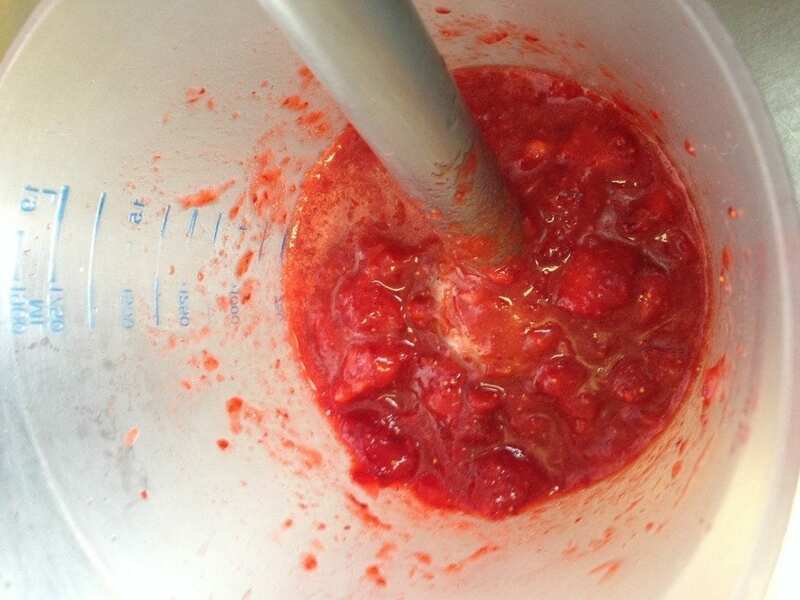 You don't want to “blend” or “emulsify” the berries to a puree but just enough to break up the chunks. I use the hand emulsifier but you can also use a food processor, just don't over do it. 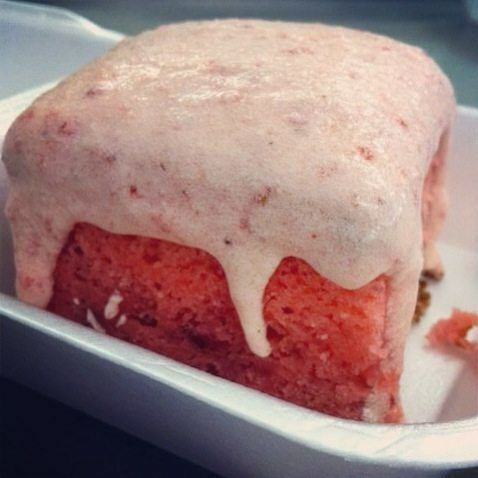 I LOVE to have the chunkles of Strawberry in the cake and frosting, so just hit it a few times. Makes it real quick and simple. 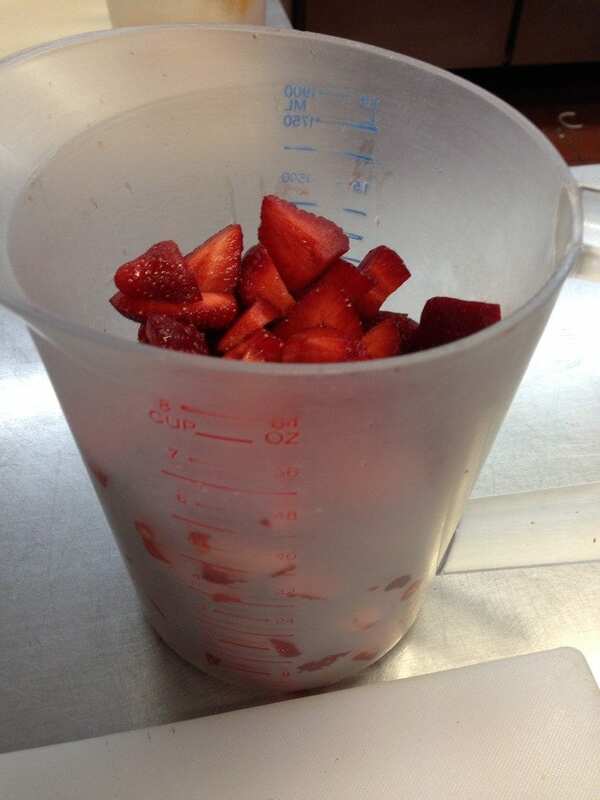 I just use our large measuring cup to cut the strawberries into and then emulsify in the same cup. Less dishes to wash in the end and multipurpose too..LOL! You're gonna need about 1 1/4 cup of crushed berries including the juice for each cake, so that's why I like to use the measuring cup to chop so you can see where you stand. These particular berries were so juicy and ripe that we pressed the button only a few times with the emulsifier and just mashed them the rest of the way with the emulsifier so we didn't over do it. Sometimes berries you buy in the grocery aren't so ripe and are pretty tough. Set aside when you are done and then be sure to set out your cream cheese and butter to soften for the icing later. I try to prepare all of our desserts from scratch but some recipes like this one, it's as good as a scratch cake, so I just go for a quality cake mix to start. I prefer to buy all of my cake mixes from Aldi Food Market if I can. They have a limited flavor selection but for the most part the ones that I need they have. I like to dry beat my cake mixes before using them as they tend to settle a great deal in the box. 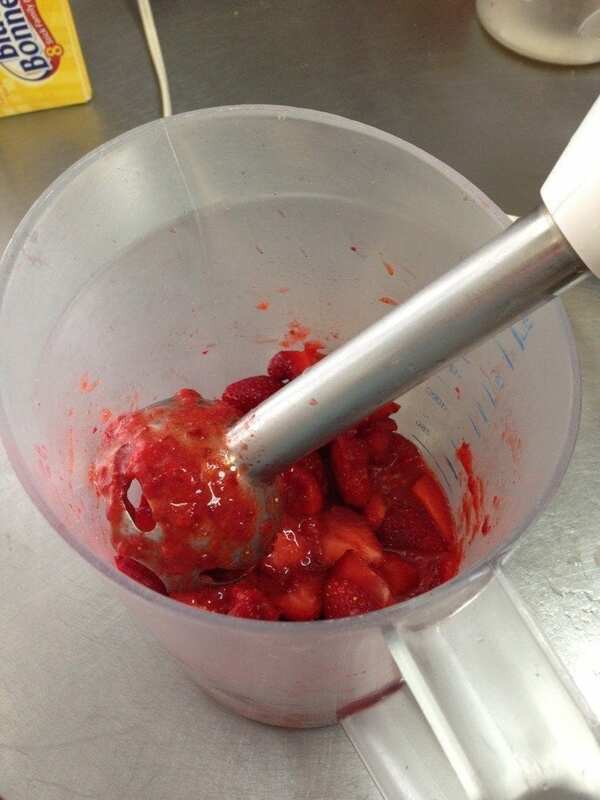 Dry beat your cake mix and strawberry jello together for about a minute until the mix is aerated. Add your eggs, milk, and oil and mix on medium till blended, scrape the sides of the bowl and then beat on medium high for 2 minutes. Reduce speed to low and add in 3/4 cup of your crushed strawberries and mix for another 30 seconds or so. In our restaurant, we prepare all sheet cakes, which is the simplest way for us to slice / box for sale, and that is primarily how I prepare my cakes at home. But, if you prefer layered cakes, prepare 2 round pans instead of a 13 x 9 sheet cake pan. Pour batter into a prepared pan. One of the BEST baking secrets I've learned from following Christy's blog (Southernplate.com) is to drop your cake pans a few times on the counter to release the air bubbles to help get a more even cake instead of it rising high in the middle and be shallow on the edges. Check out her original recipe post for the details on this. My husband Kelly hears all the racket in the kitchen when I'm executing he bubble release and I tell him he has Christy to thank for this move. LOL! It's a GREAT idea and one I use on all of my cakes now. Thanks Christy!! Bake at 325-350 for approximately 25-35 minutes. I use a convection oven, so adjust accordingly to your oven. Beating this cake mix well definitely helps with how tall it bakes up, so be sure to beat it for 2 minutes and then again after adding your crushed berries. At the 25 minute mark check your cake with a toothpick until it comes out clean in the middle. Once out of the oven, let cake cool completely before icing. I let it sit in the pan for a bit and then put in the fridge to finish cooling with a vented lid for steam release. For the Strawberry Cream Cheese Icing, I LOVE to mix the strawberries into the Cream Cheese Icing instead of using extra strawberries as a topping, but it's your cake and your preference. For our restaurant, we always mix it together and our customers just LOVE it this way!! Make it both ways and see how your family enjoys it most. Beat in your blender the softened cream cheese and butter together until smooth. You'll need to stop your blender a couple times to scrape the sides of the bowl and your beater to ensure all of the cream cheese and butter get blended together. Once smooth and well incorporated, add half your confection sugar and start blender on low until mixed in and then turn up on medium / high until well incorporated. Turn off blender and add remaining confection sugar and start again on low until blended in and then turn up to medium / high to incorporate completely. Now, if I were making my standard cream cheese icing, at this point, I'd add in a tsp of butter flavoring or clear vanilla flavoring but since I add in my strawberries, I don't use the extra flavoring in this recipe cause it's really not needed. If you are making a layered cake, you'll need to STOP here and ice your cooled cake with the regular cream cheese frosting, but if you are preparing it in sheet cake form, lets press on. Add in a 1/2 cup of crushed strawberries with the juice to your cream cheese frosting and blended again in your mixer until well incorporated. You can at this point choose to add in maybe another 1/2 cup of confection sugar if you want your icing more thick, but I like it a smidge on the runny side as it will drape down the slices on your plate once cut, again your preference. Pour the icing over your cake and spread evenly. Cover and refrigerate until you are ready to serve. Personally, I don't think you can beat the flavor of cream cheese and strawberries combined. This is just a delicious combination that is hard to beat. 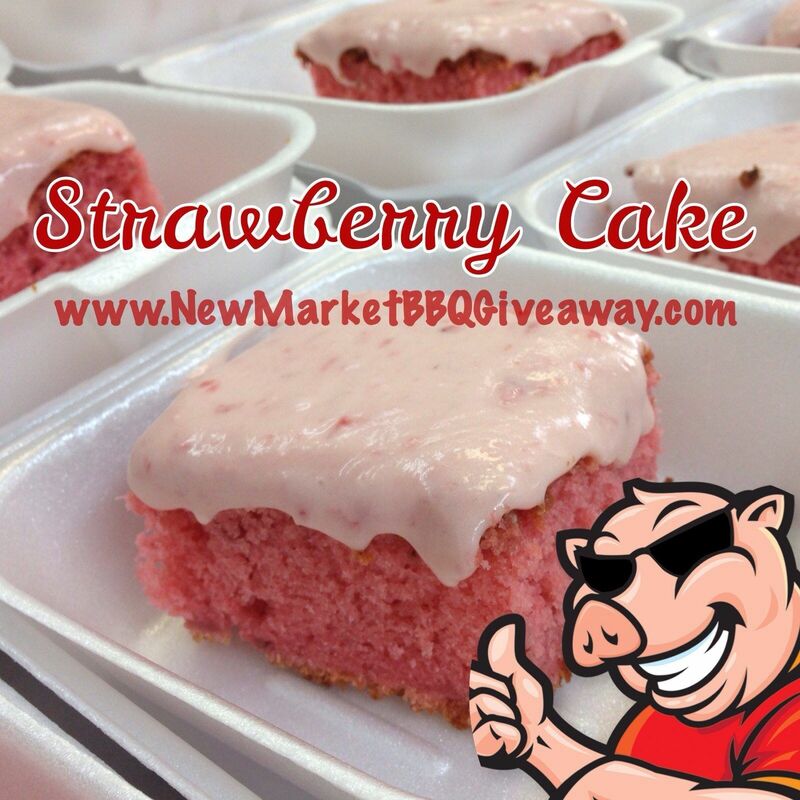 Here it is all sliced up and ready for y'all to stop in and pickup a slice or two or three at New Market BBQ! I hope you enjoy this recipe! Please be sure to save it to your recipe box so you can add the ingredients to your shopping list for the next run to the grocery. I can't wait to hear how yours turns out. Let me know which way your family preferred the icing, with or without the strawberries mixed in. HAVE FUN and ENJOY!! Don't forget to ENTER our Weekly Cake Giveaway to WIN our FREE CAKE SPECIAL! One of our TOP MOST REQUESTED Dessert Specials. Enjoy it with the strawberries mixed into the icing or use some extra crushed berries as a topping for your cream cheese icing. It's your cake, so make it the way your family enjoys it most. Have fun and enjoy! Clean / cut Strawberries and chop, do NOT over process into puree. Place cake mix and gelatin in mixer and beat for a few min. Add in 3/4 cup crushed strawberries and juice, mix again until well combined. Pour into prepared baking pans. Bake at 325-350 for 25-35 minutes or until toothpick inserted in center comes out clean. Be sure done in the middle. Let cake cool at room temp for a little bit then put in refrigerator to be sure completely cooled before Icing. Cover / Vent lid to let any stream escape while it cools. If making a layered cake, Ice your cake at this point, if a sheet cake, proceed to next step. Pour icing over cooled cake, spread evenly, cover and refrigerate until you're ready to serve. 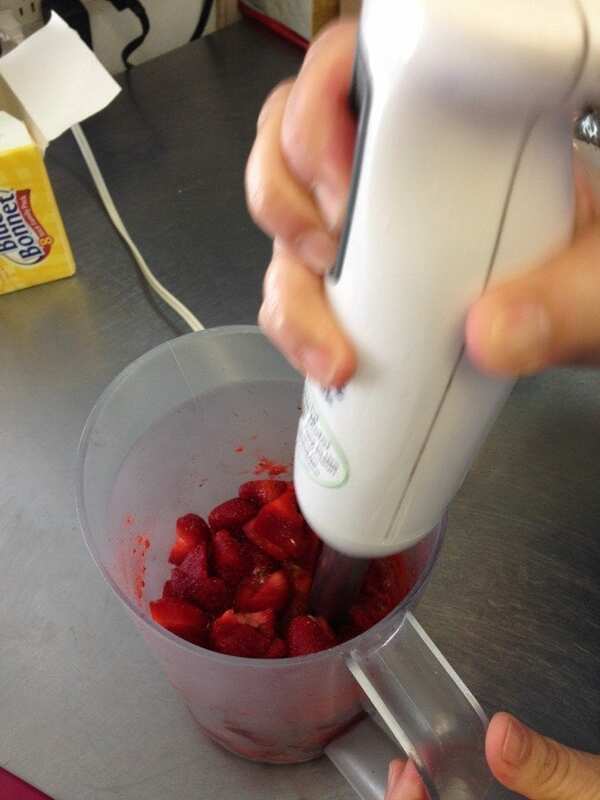 Be sure to not over process your strawberries into a puree. You want some chunks in there. ALL CONTENT PROTECTED UNDER THE DIGITAL MILLENNIUM COPYRIGHT ACT. CONTENT THEFT, EITHER PRINT OR ELECTRONIC, IS A FEDERAL OFFENSE. PLEASE do not copy recipes and post on your site or use our photos without permission (see above legal notice). Blogging about recipes and linking to the complete recipe on NewMarketBBQ.com is welcome and appreciated!